Patching SQL Server is an ongoing process. Service packs and cumulative updates are being regularly released, in order to apply possible bug fixes as well as provide additional functionality. This article, suggests a procedure for how to patch a standalone SQL Server instance. First, always patch the respective SQL Server on the Test environment. Certify that everything works well on the Test server after the installation of patches is completed. You need to get acceptance by all affected parties (i.e. IT users, application owners, etc.). Check if all user databases are OK. If not, restore them from the backup taken prior to start the patching process. If everything is OK on the TEST environment after the patching and you have the green light to proceed with patching Production (i.e. approvals/acceptance by business users/application owners, etc. ), then you may follow the same steps as above for the Production standalone server (note: make sure you get approval for an adequate amount of downtime and also take into consideration possible unexpected problems during the patching process). By running the below T-SQL script, you can find the location of the Resource Database of your SQL Server instance(s). 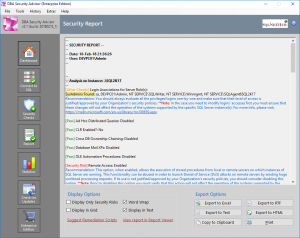 DBA Security Advisor: Secure your SQL Server instances by scanning multiple instances against a rich set of security checks, and by getting recommendations and remediation steps. Did you find this article useful and interesting? Feel free to leave your comment! If you enjoy my SQL Server administration tips and articles, I have something special just for you. It is one of my eBooks and it is called “Administering SQL Server“. Check it out! Subscribe to our newsletter and stay up to date with our latest articles on SQL Server and related technologies! Check out our latest software releases! All our software tools have 30-day Trial Versions which are free to download.